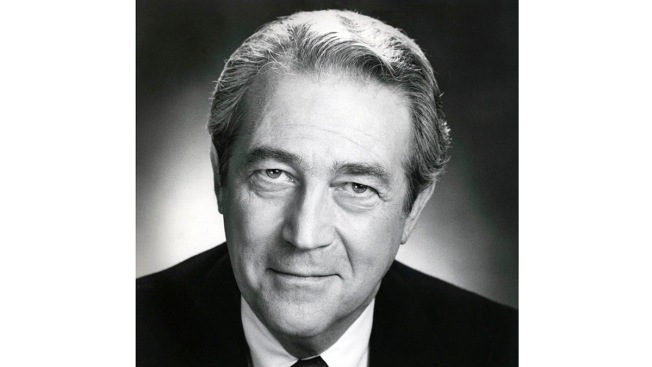 This undated image released by Rocky Schenck shows actor James Karen. James Karen, a prolific and beloved character actor whose hundreds of credits included memorable appearances in "Poltergeist" and "The Return of the Living Dead," has died. He was 94. Karen's friend Bruce Goldstein told The Associated Press that he died Tuesday at his home in Los Angeles. He had been battling respiratory ailments. Few actors had so long and diverse a career. He appeared in Elia Kazan's 1940s stage production of "A Streetcar Named Desire," which starred Marlon Brando. He befriended Buster Keaton in the 1950s and had a brief role in one of the silent star's most unusual projects, "Film," an experimental short written by Samuel Beckett. He met Marilyn Monroe at the Actors Studio in New York and filmed a commercial with the Three Stooges. He was directed by Oliver Stone in "Wall Street" and David Lynch in "Mulholland Drive." His TV credits ranged from "Dallas" and "The Waltons" to "Seinfeld" and "The Larry Sanders Show." Millions knew him as the friendly man with the glasses in TV ads for Pathmark. Others remembered him as the foreman in "Return of the Living Dead," the boss in "The China Syndrome" or the notorious Mr. Teague, the real estate developer who moves the headstones — but not the bodies — in "Poltergeist." On Twitter, Kevin Smith, Gilbert Gottfried and Joe Mantegna were among those sharing tributes. His admirers also included George Clooney. When Clooney received a lifetime achievement award from The American Film Institute earlier this year, he spoke about Karen. He called him a "wonderful character actor" and remembered getting a call from his wife, Alba. She told Clooney that Karen was near death and wanted him to write his obituary. "So I got out a bottle of booze — pen, paper — and I sat down and I spent the whole night writing about who I thought Jimmy was, his character, what he meant to us," Clooney said. "A week goes by, then a month. That was four years ago. I called Alba and said, 'What the hell.' She said 'Yeah, Jimmy's doing fine. He just wanted to know what everyone thought about him while he was still alive. He got a bunch of people to do it.'" Karen was born Jacob Karnovsky in Wilkes-Barres, Pennsylvania. He was interested in theater from an early age and, according to his friend Leonard Maltin, the movie critic, turned down a contract with MGM because he wanted to work on the stage. His years in the theater led to a close bond with Keaton. In 1957, he and Keaton appeared together in a revival of the play "Merton of the Movies" and they remained friends until Keaton's death in 1966. Karen later hosted a Keaton documentary made by Kevin Brownlow and was among those sharing memories in "The Great Buster: A Celebration," a documentary by Peter Bogdanovich that was just released. "Jim and Alba had a beautiful apartment in Los Angeles and he had a corner devoted to Buster memorabilia, including one of his hats," Goldstein told The Associated Press. "He would let me invite friends over and have them try on the hat."